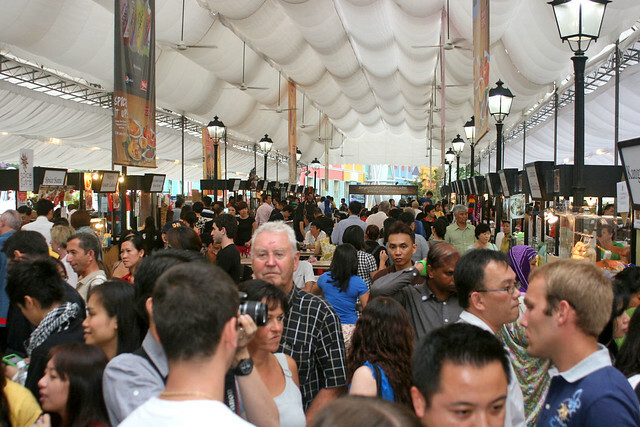 The Singapore Food Festival 2011 has begun! Festive Brazilian samba kicked off the official opening of the SFF2011 at Clarke Quay yesterday evening. 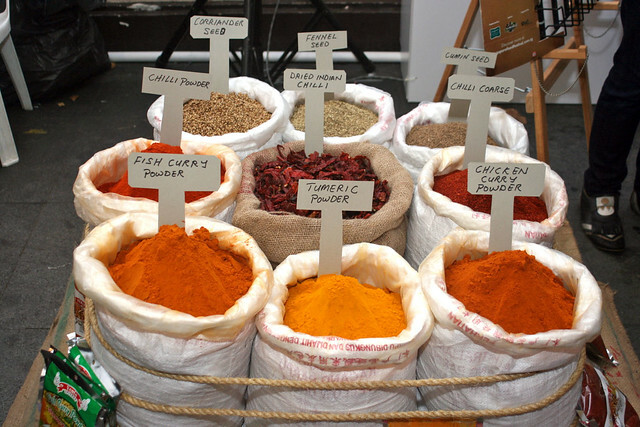 Just like last year, the entire bridge has been transformed into a "Curry and Spice Street with food stalls galore. Over 35,000 visitors thronged the opening night, up from 30,000 in 2010. That's amazing because it was a rainy evening. 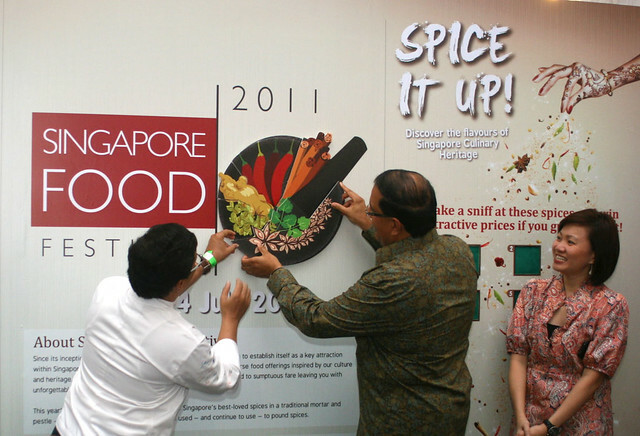 The SFF also has a new logo this year, a pretty array of Singapore's most beloved spices in a traditional mortar and pestle. The new logo reflects this year theme - curry and spices! 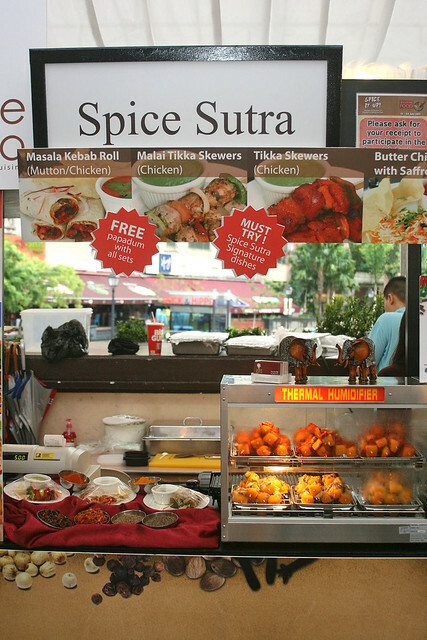 There are over 60 stalls to try on this "Curry and Spice Street" and the adjoining "Gourmet Promenade" that make up the Singapore Food Festival Village at Clarke Quay. 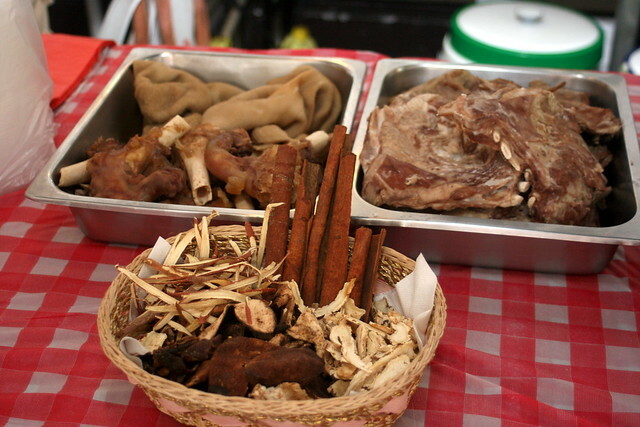 You can even see some of the spices that are used for the dishes (Chinese-style mutton soup and innards). 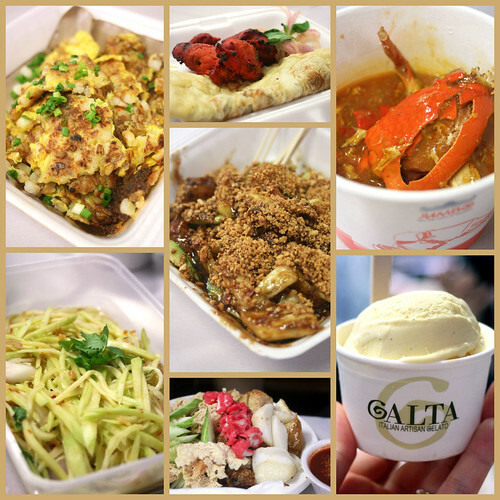 Spiced delights of all kinds await - kebabs, tandoori, fish head curry, chicken curry, rojak, popiah, braised duck, roast pork, Malay delicacies, Thai food, Indian curries with chapatis, and even snacks and tarts. 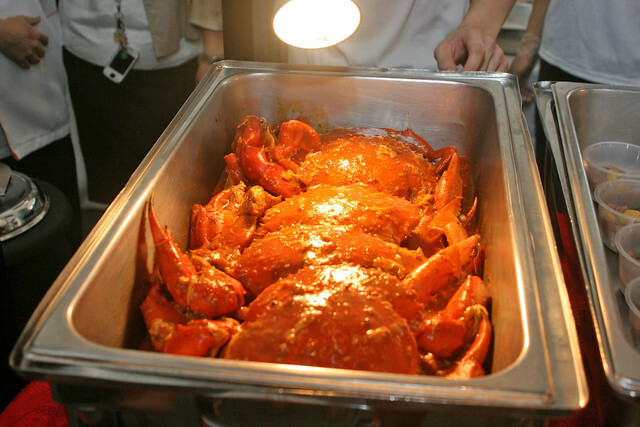 Jumbo Seafood's chili crab available for S$10 a serving. Mantous sold separately. Incidentally, Jumbo also launched two pre-mix pastes yesterday - their signature chili crab and black pepper crab, so you can whip up your own at home. The sauces can be used with any crustaceans, not just crab. I believe these are sold at their restaurants. We ate and we ate! All of us just had to have the Lim Hai Sheng carrot cake, which smelled so good being fried. There's also some "spiced up" ice cream - chili chocolate, vanilla saffron, wasabi, and raspberry ginger from the Gelato stall. 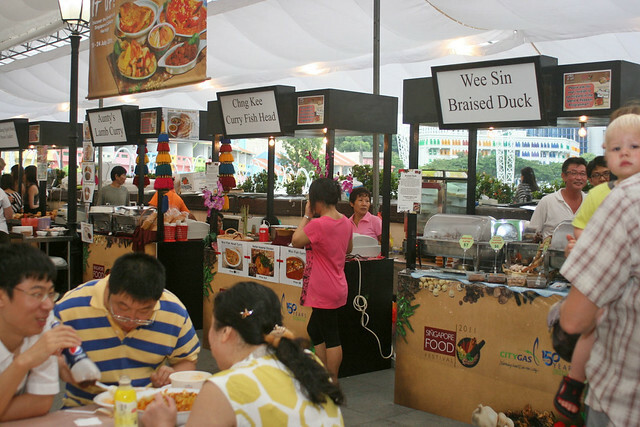 The Food Village will be on from now til 24 July. It's just one of the many highlights of the SFF2011. 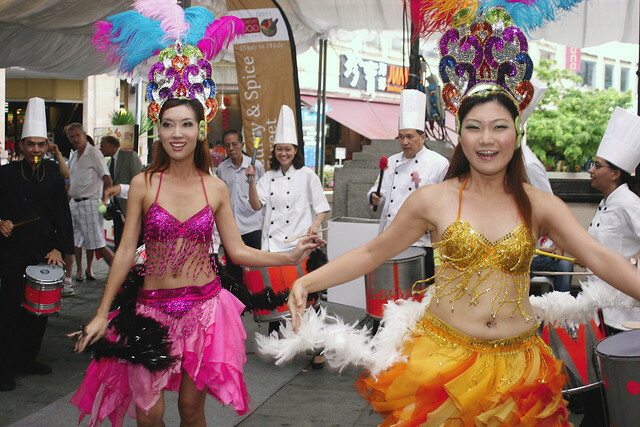 You can check out my preview of three key SFF2011 activities here - the Heritage Trail, the Tiffin Cruise and the Spices and Canapes in the Sky at Singapore Flyer. Hi! Just wanted to thank you for your post earlier about SFF. I bought tickets to the Trishaw Heritage Trail and I was there with my husband today and it was absolutely great!! Loved the food, introduction to Indian spices, vegetables and fruits and Chef Milind Sovani had a good sense of humor! I will do a post about this on my blog later! Have a great SFF-time!